Expecting a fresh wave of assaults from armed forces loyal to Kiev to start at any moment, the defiant anti-government stronghold of Slavyansk has become “eerily quiet,” with the streets, dotted with checkpoints, practically devoid of passersby. These are the impressions of RT’s Paula Slier reporting on the spot. 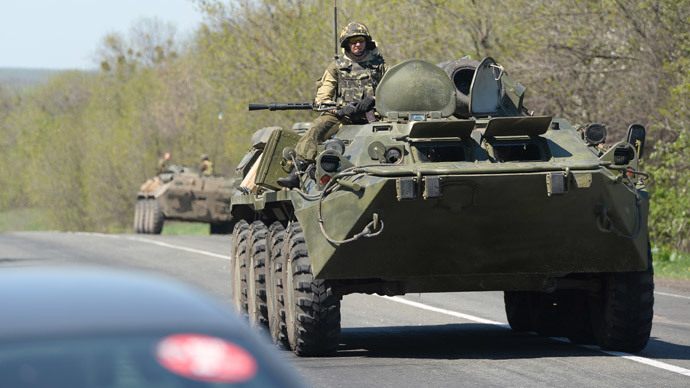 In the nearby village of Andreevka, at least 15 armored vehicles were blocked by the locals at a time when other units loyal to Kiev were storming the outermost self-defense checkpoints. A YouTube video from Yasnogorka showed a man, who was reportedly run over by an APC while fruitlessly trying to block its way. For those living in Slavyansk, Friday morning began with the sound of a warning siren and fears of army assaults and shelling of the city. 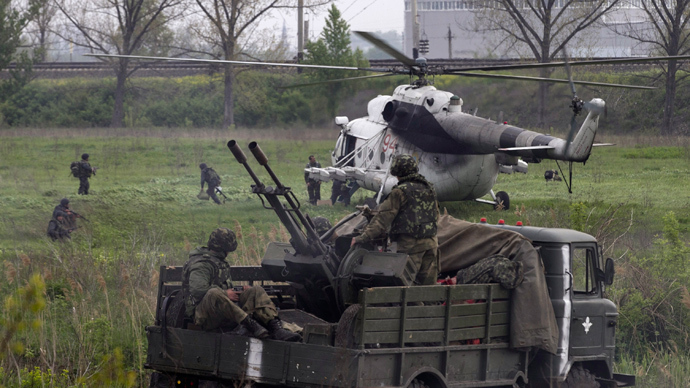 Several Ukrainian army helicopters, supporting ground troops with missile fire, were reportedly shot down near Slavyansk by armed self-defense units. 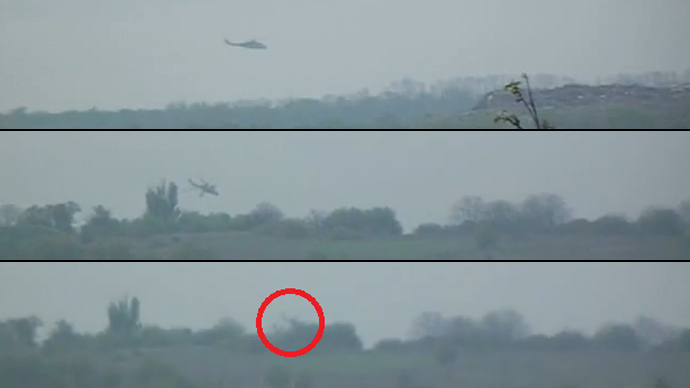 Footage showed an injured helicopter pilot who survived crashing, but was “left to die” by the retreating Ukrainian troops, according to Slavyansk activists. The man was then helped by his own “adversaries” as they brought him to the city for medical treatment. RT’s stringer Graham Phillips reported hectic scenes from the streets of Slavyansk as local self-defense rushed to prepare for an anticipated assault, setting up and reinforcing barricades and taking positions. 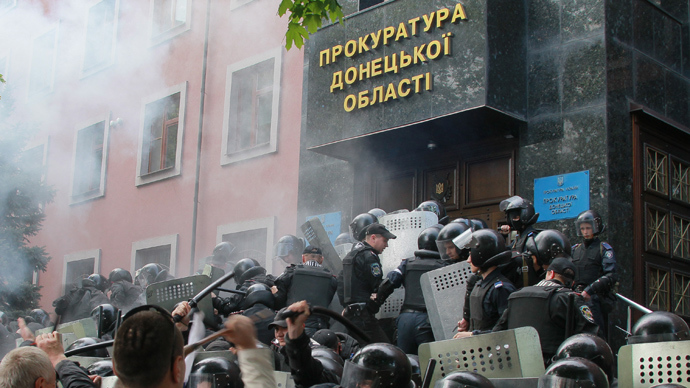 Plenty of conflicting reports arose concerning the time of possible attacks, allegedly being prepared not only by the Ukrainian armed forces and “National Guard,” but also by Right Sector units relocated to the Donetsk Region from Dnepropetrovsk. Many of the people gathering in central Slavyansk told Phillips that they are frightened for their lives and do not want any Ukrainian military sent by the “Kiev junta” in their city. One woman interviewed by Phillips appealed to Russia and personally to President Vladimir Putin for help, saying the people are getting desperate. The others had a message for US President Barack Obama, whom they blame for the chaotic developments in Ukraine. “Obama is meddling with war everywhere. America long ago stopped being a ‘guarantor of peace’ in the world. They call themselves peacekeepers, but show me just one country where the US has brought peace and prosperity. Syria, Libya, Egypt, revolutions are being organized everywhere. The American presidents have for a long time been bringing only death,” a woman told Phillips on camera in an emotional statement. 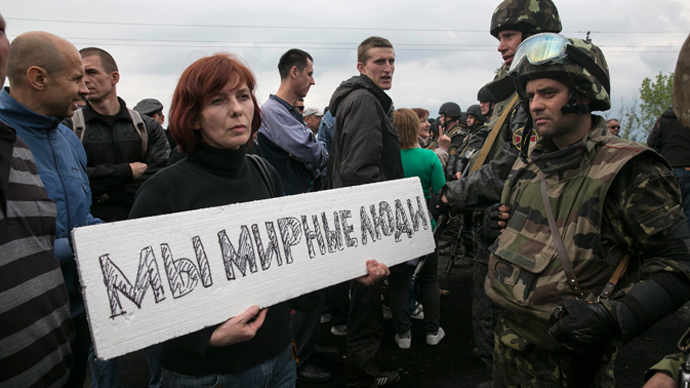 The protesters frequently called on world leaders to come to Slavyansk and see for themselves what sort of “terrorists” or “separatists” they are. The others, standing on the barricades with the city’s self-defense, said they are determined to fight for Slavyansk to the last. “What has come down on us, this is not life. I am prepared that I may be killed, but I am sure that together we will defend our native city to the last,” an activist told RIA Novosti. “We want neither nationalists, nor oligarchs here. All those bandits and thieves – let them bypass our region… My grandfather fought his way to Berlin, and I cannot betray him, betray what he was fighting for,” another activist said.